Last year I saw something in the bloggy world about "Project 365" but I never really gave much attention to it. It seemed like a mom thing, and well at that time I was all about avoiding "mom things". Hey give me a break I was a newlywed. Am I still a newlywed? When does the newlywed status end? Some people say it ends when you've had your first big fight. That would mean our newlywed status ended on our honeymoon. We are good at fighting. It's my spiritual gift. Anyways. This was the first year that I really looked into Project 365 and decided to go ahead and give it a whirl. Everyday I will take a snapshot that represents the day and then I will write down about 2-3 sentences that describe that day (or the picture if it fits). I am excited to do this and hope that I will stick with it for the full year. I think it will be fun to look back and see what the heck we did when we didn't have kiddos. Jessica's blog is what really got me turned on to doing Project 365 this year and each Tuesday she will host Project Life where everybody can share their pictures. I am excited to participate. Monday January 4th: A thrilling night of jogging, dinner and The Bachelor. Luke watched it for the first time EVER with me and had some funny comments. Tuesday January 5th: Will came over to eat dinner with us and then the boys practiced their tunes for next week's show. 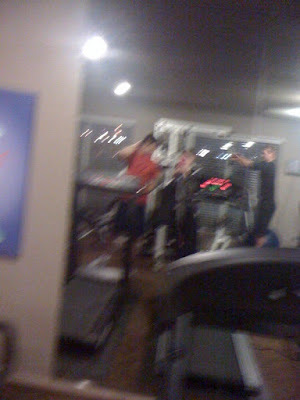 Wednesday January 6th: After work we went jogging in our apartment gym. I snapped this picture of us leaving, but as I snapped it I saw the guy behind us (in black) watching and I got nervous cause it was awkward that I was taking a picture in the gym and I pulled away, hence the reason it is blurry. But its my only picture from the day. Thursday January 7th: Mexican food night!! I made tacos and queso and we watch the BCS Bowl Game Friday January 8th: Dinner with friends! Saturday January 9th: Looked at houses all morning then a surprise party with friends from church that evening! So that was our first week. Clearly we live thrilling lives of lots of TV watching. It's not too late to start your own Project 365! What a neat idea! I may totally do this! I'm always in need of blogging material (you'd think I'd have enough with my four crazy kids though)! Yay! I'm glad you decided to do it! It really is cool to have when the year is over, even when it's a pain some days! And I know how it feels to take photos in odd places. Last June I remember asking my dentist if he'd mind me taking a photo of him with his tools. Yep. It was weird. Ohh I'm jealous - I have always wanted to do Project 365 but I want to do it when I have my big fancy camera. But I love it!! Yay! Yay! I'm going to try it...except I don't have pictures from last week. Maybe I'll just write about last week and then start with pictures from this week. :) Thanks for being a great bloggy inspiration! Oh what fun! Can't wait to see your daily life via photos! I so wanted to do this but then I just kind of forgot about it. Love that you are doing it though. You should have a link to your photos each day. Love the pics! I really like your idea of a Christmas card book!! Aww this looks so fun! Can't wait to see it throughout the year. and your mexican night looks delicious!! Great Idea. I am going to start this today! Haha...I tried to do this last year and made it like 4 days! It's harder than you think! I am sure you will do great though since you are better about blogging in general! Very cool! This seems like a lot of work, but I'm sure you will look back on it and be so glad you did it! I can't wait to see the updates on this!! I tagged you for an award.. check out my blog! Hi! I found you through Jessica Turner's blog. First, the fact that you said fighting is your spiritual gift is hilarious. I can relate! Second, having done Project 365 last year, there will be many times you might have to "fudge" a picture of the day, so if it were me, I wouldn't think twice about re-taking the gym picture another time and using it for that day last week. Totally did things like that last year, just a thought if the blurriness bugs you.